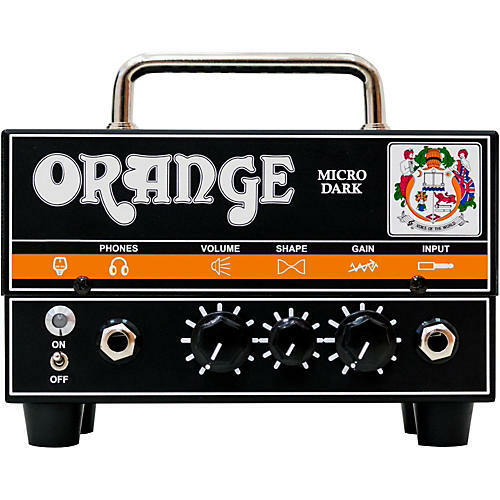 After much player demand, Orange is building on both its diminutive Micro series and high-gain Dark series with the aptly named Micro Dark. It has more gain than the original Micro Terror, and it's smaller than the Dark Terror, an awesomely potent combination. This 20W hybrid head comes loaded with a single 12AX7 preamp tube for authentic tube overdrive, paired with a bullet-proof solid-state power section and stuck in a package that can fit in the glove box of a car. The end result is a deceptively loud head that's bursting forth with high-gain Orange tone. The controls are simple as can be. With just three knobs - volume, shape and gain - it's unbelievely easy to dial in your tone. The shape control varies the midrange response along with the bass and treble, so rotating it to the left will add mids and smooth the highs, while a twist right will reduce the mids and brighten the tone. And one twist of the gain knob will show that, despite its adorable stature, this thing is no novelty. It cranks out serious, high-gain, face-melting tone at volumes that'll leave you shocked. Further building on the outstanding Micro platform, the Micro Dark comes equipped with a transparent, fully buffered FX loop, so you can use your favorite pedals with ease. Using the built-in CabSim headphone output - which simulates a 4x12" cab output through headphones or as a direct out - or the optional PPC108 1x8" cab, The Micro Dark is an ideal practice rig. But if you dare to plug it into a full-sized cab, it can turn into a mighty studio weapon. Dimensions: 6.5 in. x 5.3 in. x 3.74 in.